Primary care practices in Rochester, N.Y., are pilot testing an app that screens patients for domestic violence and makes actionable recommendations for victims and their doctors. A team of researchers and advocates at Rochester Institute of Technology and Resolve of Greater Rochester (RESOLVE) developed the software program. "Family care practitioners are often the first place victims of domestic violence turn for help," said Allison O'Malley, RESOLVE CEO. "Intimate-partner violence (IPV) is a complex issue with many negative health implications, and physicians need to know what to do when patients disclose abuse or when their symptoms raise concern." Participating physicians are offering the app to patients when domestic-violence screening suggests a risk or if abuse is disclosed during an office visit. Health workers are also taking the app into the community. O'Malley provides protocols for administering the app and for patient follow-up. 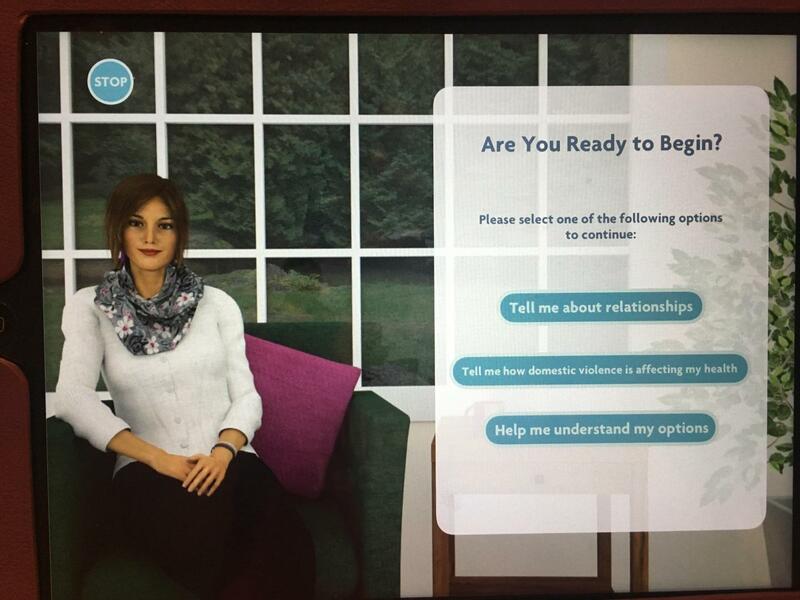 The software program features an avatar named "RITa®" to assess a patient's mental health and physical safety. RITa® is installed on local iPads kept at the medical practices. Intimate partner violence is a widespread public health issue that affects one in four women, one in six men and one in two LGBTQ persons in the United States, according to the Centers for Disease Control. O'Malley recognized the need for standardized digital IPV screening and teamed up with Caroline Easton, professor, and Nicole Trabold, assistant professor in RIT's School of Behavioral Health Sciences. "Patient centered innovations like RITa® can help meet the physical and mental health needs of victims of violence," Trabold said. The interactive avatar asks 30 validated questions to assess a victims' status and make recommendations to the patients and their physicians. The avatar also teaches victims about relationship dynamics and how living with an abusive or violent partner can impact their health. "RITa® is the first application of a 'female' avatar to screen for IPV among victims," Easton said. "RITa® illustrates how we can combine advancements in science and technology with art and design to make a real impact in our community and provide safety for those at risk for serious harm or injury." RITa® evolved from Easton's therapeutic model that identifies and treats addiction and anger as underlying causes of family, domestic and intimate partner violence. Easton's team translated her alternative treatment approach into the cell phone apps RITch® and RITchie® to screen and treat adult and young adult male offenders. These virtual coaches are used in conjunction with cognitive behavioral therapy, to model coping skills for reducing and eliminating alcohol and substance abuse, and for managing aggression. Easton and an RIT student team, led by Steve Maier, lecturer in RIT's School of Interactive Games and Media, customized RITa® to interface with victims of abuse. RESOLVE supported student work on the project with a $15,000 grant from Greater Rochester Health Foundation. O'Malley and Trabold contributed intellectual content and input on the avatar's navigational flow. Caroline Easton is a professor in RIT's College of Health Sciences and Technology School of Behavioral Health Sciences. Her research ties addiction and substance abuse to domestic/intimate partner and family violence. Her treatment model has been adopted by clinicians in the United States, England and the Royal Commission into Family Violence in Victoria, Australia. Following the Newton, Conn., school shootings, the Connecticut General Assembly Public Health Committee asked Easton to identify common causes of violence and develop prevention strategies for pilot projects. In the report, Addressing Family Violence in Connecticut: Strategies, Tactics and Policies, Easton called for intimate partner violence reform and evidence-based treatment methods grounded in science and theory. Nicole Trabold is an assistant professor in RIT's College of Health Sciences and Technology School of Behavioral Health Sciences. She is a social work practitioner, educator and health-systems researcher who recently completed a National Research Service Award Fellowship at the University of the Rochester School of Medicine and Dentistry.